The Berkeley Arts Council is offering three new workshops for artists and artisans. Do you know how to write an effective artist statement? Artists frequently must provide artist statements for all kinds of exhibits, whether they are major juried or solo opportunities or showing a few pieces in a local gallery. Registration Required; Deadline Tuesday, March 5. Registration Required; Deadline Tuesday, March 19. Some opportunities for artists require an artist’s resume. These include certain teaching opportunities, grant applications, and even job applications under some circumstances. Registration Required; Deadline Tuesday, April 2. Artist Hilda Eiber works with class participants during the Introduction to Pottery and Handbuilding class. The Berkeley Arts Council announces their spring Art Instruction Program for adults and young people ages 12 and up. Classes will begin the week of February 25. The selection of evening courses includes Pottery/Ceramic Sculpture, Beginning and Intermediate Watercolor Painting, Introduction to Oil Painting, and a new class in Mixed Media, for creative individuals that want to try a little bit of everything. A daytime class for home school students ages 12-18 titled Creative Art Exploration, is offered on Monday from 10 a.m. to 12 noon. All classes are taught by certified art instructors, and local, well-known artists who are experienced teachers. Registration for each series of six, two hour classes is on first come- first served basis. Class descriptions and online registration can be found on the Berkeley Arts Council web site at www.berkeleyartswv.org/instruction/. To register by mail, download the form. For information email berkeleyartswv@gmail.com or call 304-262-1611. 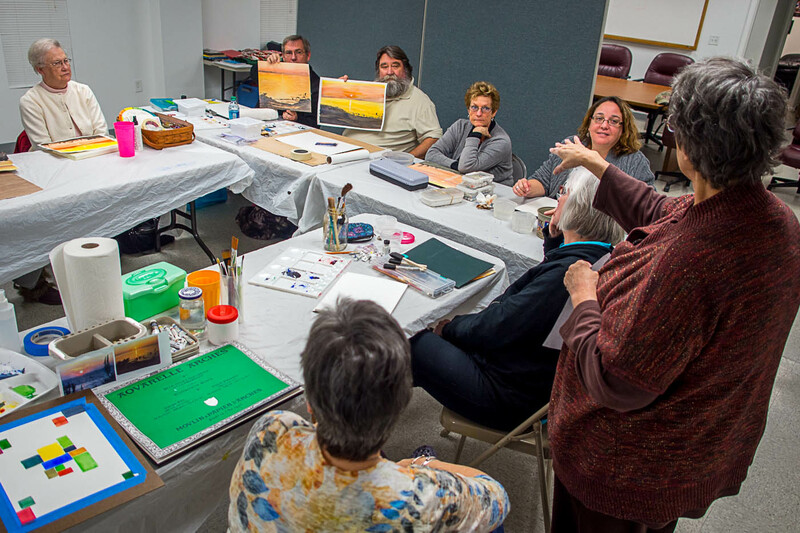 Watercolorist Anna Hogbin discusses the techniques used in painting sunset scenes during the Introduction to Watercolor Painting class. The payment of $75 can be made by check or by mail, or through the website using a credit card or PayPal. The classes are offered with the cooperation of the MBC Parks and Recreation Board and are held at the Berkeley 2000 Recreation Center. The pottery class is held at the pool building at War Memorial Park.